Patents may be withdrawn in the US. The WITHDRAWN field is a Boolean and requires a true (T) or false (F) as the only acceptable values. 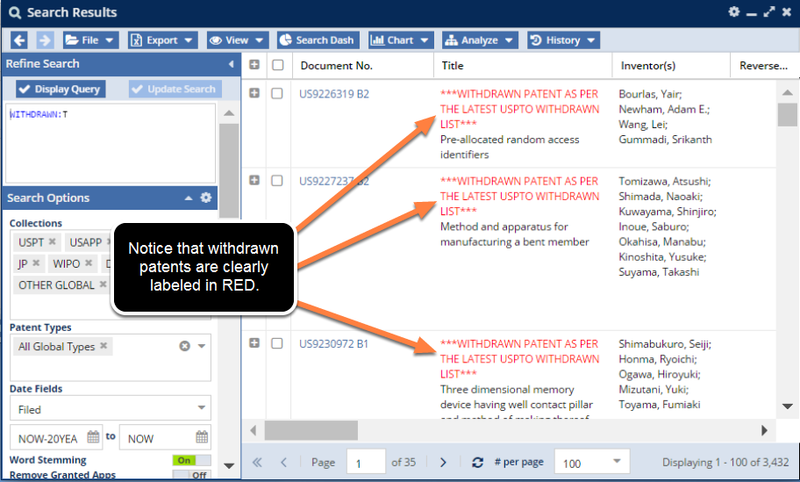 Use the WITHDRAWN field code to find patents that are withdrawn and no longer enforceable. It is important to note that if the patent is NOT withdrawn then the field is empty (see the examples below). WITHDRAWN:T --> Finds patents that are withdrawn (as in the example image above). WITHDRAWN:F --> Returns an empty set, since the values in the fields, as stated above, are really T and empty (actually, as of this writing, there are 6 patents that will be returned if you use this query. This is because the patent was subsequently UN-withdrawn after first being marked WITHDRAWN by the USPTO). NOT WITHDRAWN:T --> Removes withdrawn patents from your search results. This is one of those cases in a Boolean search where the third state can be blank or empty. So to find NOT withdrawn patents, this is the correct query to use. So, although it is available, you should NOT use the WITHDRAWN:F query. Use this query instead.